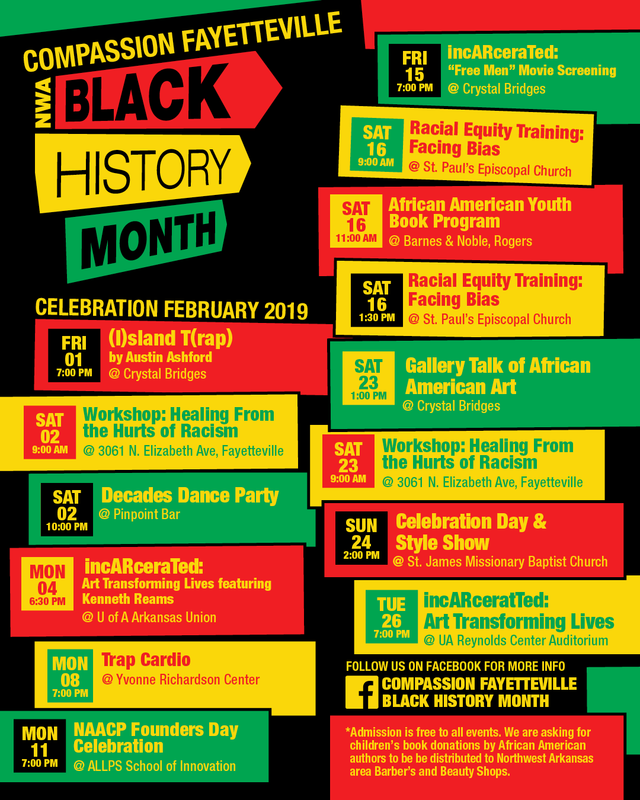 February is Black History Month, and several events to commemorate the occasion are planned in and around Fayetteville this year. Compassion Fayetteville and the University of Arkansas have organized nearly two dozen Black History Month events, including performances, film screenings, workshops, trainings, speakers, and more. The festivities begin on Friday, Feb. 1 with a performance of (I)sland T(rap), a new play by Austin Ashford to be performed at Crystal Bridges at 7 p.m. that evening. Other events include a workshop titled Healing From the Hurts of Racism at 9 a.m. on Feb. 2, a Decades Dance Party celebrating black music from history at Pinpoint Bar also on Feb. 2, a screening of “Free Men” at Crystal Bridges Feb. 15, a series of events titled “incARceraTed: Art Transforming Lives” at the UA on Feb. 4 and 26, a gallery talk on African American art at Crystal Bridges Feb. 23, a Celebration Day and Style Show event at St. James Missionary Baptist Church on Feb. 24, and several more. UA events will kick off with “My Black is Beautiful,” a First Friday event hosted by The Center for Multicultural and Diversity Education from noon to 2 p.m. Friday, Feb. 1, in the Arkansas Union Connections Lounge. 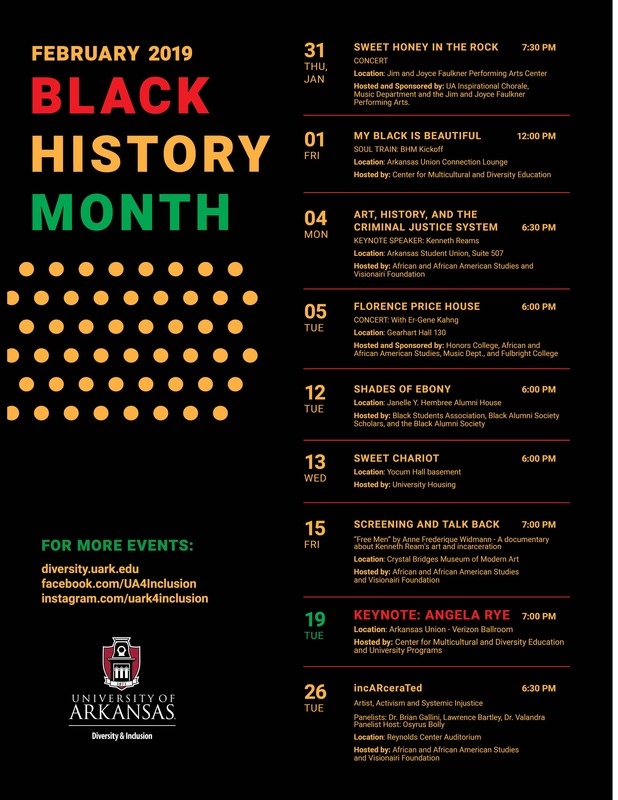 A complete list of Black History Month events is available at diversity.uark.edu. More information about specific events is also available at the Compassion Fayetteville Black History Month Facebook page.